Beyond the headlines, the work goes on, as does continuous debate and discussion to further the movement amongst Palestinians at home and abroad as well as among global solidarity activists. There is much to discuss and some of the issues are difficult ones, including questions of framing. 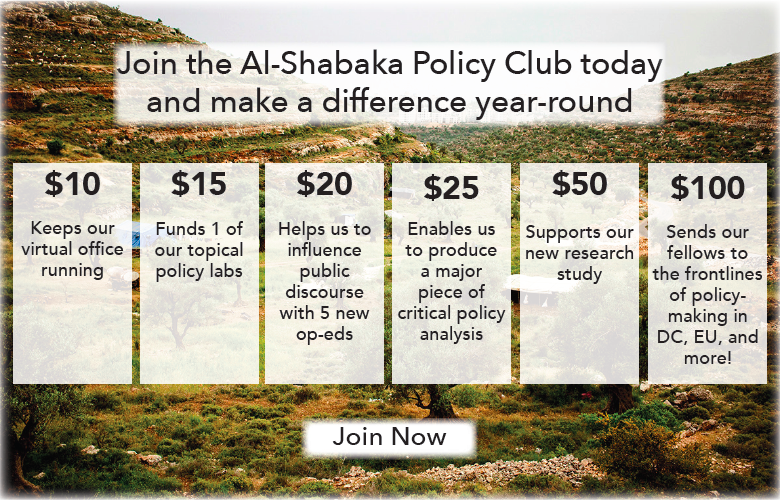 Al-Shabaka Executive Director Nadia Hijab discussed some of these issues in a wide-ranging conversation with Omar Barghouti. Omar began by clarifying that all the views he expresses here are his and his alone; they do not necessarily reflect the views of the wider BDS movement or its Palestinian leadership, the BDS National Committee (BNC). Threats to Human Rights Defenders: How Far Will Israel Go? Omar, thanks for making the time at this especially difficult juncture (to put it mildly) for the movement and for you personally. The BDS movement’s goals – self-determination, freedom from occupation, equality for the Palestinian citizens of Israel, and the right of return – encompass Palestinian rights under international law. But we know that the BDS movement will not on its own achieve Palestinian rights. What other movements are needed and what mix of strategies is necessary? Boycotts have historically been one of the main popular resistance strategies available to Palestinians of all walks of life, and today, in the realm of international solidarity, BDS is the most important and strategic form of support to our struggle for self-determination. The BDS movement has never claimed that it is the only strategy to achieve full Palestinian rights under international law. Nor is it possible to expect it to deliver Palestinian rights by itself. Among other strategies are, for example, local popular resistance against the wall and colonies as well as legal strategies to hold Israel and its leaders accountable for the crimes they have committed against the Palestinian people. In fact, one of the most significant strategies available to us that is hardly being pursued is diplomatic and political work with parliaments and governments across the world to isolate Israel’s regime of occupation, settler-colonialism and apartheid and have sanctions imposed on it similar to those applied to apartheid South Africa. Taking this path is primarily blocked by a complicit Palestinian officialdom that lacks a democratic mandate, principles and vision. "The BDS movement has never claimed that it is the only strategy to achieve full Palestinian rights...Nor is it possible to expect it to deliver Palestinian rights by itself." A very important component of Palestinian resistance to Israel’s regime are Palestinians in exile, who represent half the Palestinian people. We are not just talking about refugee communities, who are clearly the most important to consider, but also Palestinians, like those active in Adalah New York, Students for Justice in Palestine chapters, social movements in the UK or Chile, and their equivalent across the world of Palestinian communities in exile, who play a leading role in promoting Palestinian rights, including through BDS-related actions. Palestinian citizens of Israel are also often forgotten when people talk about Palestinian resistance, despite their crucial role not only in steadfastness in the face of Israel’s regime of Zionist settler-colonialism but also their active popular, academic, cultural, legal and political resistance to the regime and its institutionalized and legalized racist structures and policies. But the traditional Palestinian political discourse of the 1960s, 1970s, and 1980s is largely gone. In South Africa, the national liberation movement remained active until the very last minute, but we have, unfortunately, lost much of what made up the Palestinian national liberation movement largely due to the Oslo agreements. The Palestinian leadership, with the explicit or implicit endorsement of most Palestinian political parties, has surrendered basic Palestinian rights and accepted dictates by the United States and European Union to adapt to most of Israel’s regime of colonial oppression. The Palestinian people is now in a state of loss and disarray. There is no longer a Palestinian “national consensus,” if ever there was one. Even the Palestinian political parties, right and left, Islamist and secular, with almost no exception, talk of “independence” and not national liberation, often forgetting the refugees and always omitting Palestinian citizens of Israel from the very definition of the Palestinian people. It is up to the entire Palestinian people to determine its future and the solution to this colonial conflict. In the meantime, every Palestinian individual, group or coalition must strive to weaken the Israeli regime of oppression, as a prerequisite to attain Palestinian rights under international law. We in the BDS movement have opted for developing one, time-honored form of Palestinian resistance and the most effective form of grassroots international solidarity with it, based on rights, not political solutions. BDS of course recognizes that there are other strategies and approaches; we’re just saying that we chose to focus on the rights, not the solutions, because for any political solution – determined by the majority of Palestinians everywhere – to be just, comprehensive and sustainable it must accommodate our rights under international law. Moreover, to be effective you need to have something close to a Palestinian consensus, and to achieve that we had to stick to the most principled and strategic lowest common denominator, to the most significant and least controversial goals of the Palestinian people that hardly anyone can object to: Ending the 1967 occupation, ending the system of apartheid, and fulfilling the right of return of Palestinian refugees to their homes and properties from which they were ethnically cleansed during and since the Nakba. And we adhere to these rights strictly. This approach has brought us broad support amongst Palestinians. The BNC recently organized a relatively large rally in Ramallah in a show of popular Palestinian support for BDS. I personally do not see that kind of street mobilization as a decisive indicator of popular support, but my colleagues insisted we needed to do it in order to demonstrate to the world the popular appeal of BDS. There were over 2,000 people and many speakers from political parties and grassroots movements and unions, all of whom expressed strong support for BDS. One of the outcomes of that rally was to defuse the perception among some local circles that BDS was “elitist”. There are those who don’t want to support the nonviolent BDS movement because it’s “below their political ceiling.” Being revolutionary, in my view, is not about raising “revolutionary” slogans that are not implementable and that therefore have little chance of contributing to processes aimed at ending the reality of oppression. What is truly revolutionary is raising a slogan that is principled and morally consistent and yet conducive to action on the ground that can lead to real change towards justice and emancipation. Otherwise you remain an armchair intellectual. And yet the way the BDS movement is sometimes represented makes it sound as though it alone can actually achieve Palestinian rights. The frequent references to South Africa convey that impression, whether intended or not. We Palestinians always compare our strategies and progress to South Africa and other movements for justice, self-determination and human rights – and we know that we’re missing key pillars that were critical to their success. In South Africa, for example, the African National Congress-led struggle identified four strategic pillars for the struggle to end apartheid: Mass mobilizations, armed resistance, an underground political movement, and international solidarity (particularly in the form of boycotts and sanctions). There is no “copy-paste” strategy to achieve liberation and human rights – every colonial experience is different and has its unique particularities. We have been engaged in evolving our own Palestinian strategies that suit our environment of struggle for justice and dignity. In the case of the Palestinian struggle, the pillar of the underground movement is limited to Gaza, where it is isolated. International law upholds the right of any nation under a foreign occupation to resist it by all means, including armed resistance, so long as all forms of resistance themselves adhere to international law and human rights principles. Aside from that, as human rights advocates, we are obliged to consider the cost-benefit of this pillar at this stage and to measure the human price of any resistance. As for mass mobilization, what we can do in the occupied Palestinian territory in terms of popular resistance, for example, against the Wall, is fairly limited. And it is not really a mass movement in the way that, for example, the recent teachers' strike was popular, or the strikes against the Salam Fayyad government’s neo-liberalism or against the social security law were popular. The whole question of the effectiveness of different forms of resistance is key and we in the BDS movement engage in the question of the effectiveness of our nonviolent, international law-abiding strategies at every stage. Another concern is that some of the BDS movement’s discourse makes it sound as if Palestinians are on the point of achieving their rights. That comes out not only in the frequent references to the South Africa “moment”, but also in statements that say that a “tipping point” has been reached. Yes, but when we speak of a tipping point, we mean a tipping point only in terms of the specific pillar of international isolation. The measure of effectiveness is whether you’re achieving your goals or not. BDS is one of the strategies of internal resistance and it is also the most important international strategy. We never claimed otherwise. Why, then, should BDS be held responsible, say, for the inability of the Palestinian people to achieve our goals of self-determination and national liberation? At least give us credit for being realistic. There are many and growing critiques of the international law framework. Does that pose a problem for the BDS movement given it is grounded in international law? To be effective in mobilizing international pressure by groups and individuals of conscience against Israel’s regime of oppression, as well as morally consistent, we must adopt human rights principles that are as universal as possible as well as a language that can touch people across the world and inspire them to action. That’s the language of international law. We know the inherent flaws of international law as well as anyone. But we also know that it is either that or the law of the jungle, and the latter does not work for us, on principle and practically, given that we are by far the physically weaker party. We don’t want symbolic rhetoric: We’re sick and tired of rhetorical support. We need effective, strategic action that has a chance to undermine the system of oppression in order to make it more realistic for the Palestinian people to realize our UN-stipulated rights. The minimal action people can take is to end their complicity. That’s a profound legal and moral obligation to end this injustice; it is not an act of charity. What are the alternatives to international law? It’s true that the colonial empires wrote it. It’s true that it is not weighted in favor of the peoples of the world, but it is not a dogma or a static set of laws that are engraved in stone. There is a simplistic view of international law that doesn’t see it as something dynamic, as something where we, through our persistent and mass struggles, can affect the interpretation and the application. After all, we are not asking for the moon; we are simply working to consistently apply international law to Israel and to end its exceptional status as a state above the law. That is a simple yet far-reaching demand that requires years of strategic struggle. There is lack of clarity around the normalization guidelines that is often a source of tension with activists – and especially among Palestinians who may engage in activities that are said to be “normalizing” and who don’t appreciate what seems like having their nationalism called into question. The normalization guidelines are very clear. The reference document to that was adopted by consensus at the first national Palestinian BDS conference, held in November 2007. Normalization, in this context, is understood by Arabs, including Palestinians, to mean making something that is inherently abnormal, like a relationship of colonial oppression, appear deceptively normal. According to the BDS guidelines, there here are two main principles in order for a relationship between a Palestinian (or Arab) party and an Israeli party not to be considered normalization. The Israeli side must recognize the comprehensive Palestinian rights under international law, and the relationship itself should be one of co-resistance to oppression, not “co-existence” under oppression. The whole point is that such relationships should not legitimize, fig-leaf or whitewash Israel’s violations of Palestinian rights. To consider an example that may not be immediately obvious, say an organization in the United States is organizing a conference and has received sponsorship from Israel or an Israeli institution that is complicit in violations of Palestinian rights. And let’s say that the US organization is willing to have a panel that would include Palestinian speakers so as to provide space for a Palestinian voice. Participation under these circumstances would mean that we are effectively normalizing Israeli sponsorship – in other words normalizing the violations of our rights. This is too high a price to pay for our voices to be heard, as important as that is, given the mainstream media’s suppression of these voices. So we work closely with partners to apply pressure to rescind that Israeli sponsorship, and if that fails we call for a boycott. But there are still gray areas, and it is in the gray areas where problems can arise – especially as some people take it on their shoulders to speak on behalf of the BDS movement and to lay down the law when in fact they have no authority to do so. There are always gray areas. I would say 90% of the cases that we deal with are indeed gray. When we come across a gray area, we go back to the principle and try our best to measure profit vs. loss. BDS, after all, is not intended to be a dogma, but rather an effective strategy to contribute to our struggle for our rights. The Palestinian BDS National Committee (BNC) simply mobilizes moral pressure to expose normalization activities in order to undermine normalization. It is vital to counter normalization activities because they constitute a key weapon that Israel has used against the movement and against the Palestinian struggle for rights in general. And sometimes we do things that are seen as ahead of their time or use language that is not yet accepted. For example, when we first used apartheid as a key facet of Israel’s regime of oppression or insisted on the right of return in our international discourse, both were frowned upon not only in the mainstream but even in some Palestine solidarity circles in the west. Also, when the 2004 call by PACBI (the Palestinian Campaign for the Academic and Cultural Boycott of Israel) mentioned Zionism as a racist ideology that has been a pillar in Israel’s settler-colonial regime, this issue was hardly discussed in most Palestine solidarity circles in the west in the post-Oslo period. It’s important not to conflate opposition to Zionism and to Israel’s regime of colonial oppression and apartheid as being an opposition to Jews: It is absolutely not. The BDS movement has consistently and categorically rejected all forms of racism, including Islamophobia and anti-Semitism. The fact that 46% of non-Orthodox Jewish-American men under 40 support a full boycott of Israel to end its occupation and human rights violations, according to a 2014 poll, partly attests to the inclusive, anti-racist character of the movement. Can you give an example of what you do when there is a gray area? We never take decisions as individual members of the BNC or of its academic and cultural arm PACBI when there’s a gray area; we always go back to the group and decide collectively, based on the agreed upon principles, not the personal opinions and biases of each of us. We don’t give our advice or recommendation until we reach consensus. If we have a deadlock we say to the person seeking advice that we don’t have clear advice to give them. We pick our battles. We don’t chase everything, and we ignore so many targets based on cost-benefit calculations. We don’t issue edicts; rather, we issue advice. We never say “thou shalt”. And we never use ad hominem attacks – we have never done so since BDS was founded in 2005. We attack positions and statements but not individuals, and we don’t believe in blacklists or any form of McCarthyism. It negates our principles, it’s an abuse of power, and it’s counter-productive. Personally, I’ve never engaged with anyone who, for example, attacks us as “agents of imperialism” or similar ultra-left nonsense. We pick our battles, as I said earlier, and we keep our eyes on the real enemies. When we engage to stop a normalization activity, our objective is always to first and foremost convince the person involved to stop normalizing. You can’t use ad hominem attacks and expect that person to side with you. And in fact many Palestinians who were engaged in normalization 10 years ago are now BDS supporters, and that’s partly because we avoid personal injury. It’s wrong on principle and it’s pragmatically wrong. When someone has a question, we recommend seeking advice from PACBI or the BNC, or one of our partners in any given country and we seek to resolve it through interactive debate. We now have much better mechanisms to implement the guidelines. There is a gray area that was cited to me as an example of something Palestinians don’t understand, and indeed find problematic – that of Arab passport holders entering Israel on a visa issued by an Israeli embassy being treated as normalization, as opposed to getting a permit issued by the Israelis at the request of the Palestinian Authority (PA). People don’t get the difference because Israel issues both. That is a sticky point and a very difficult one. After extensive debates, community meetings and discussions with many Palestinian artists and cultural organizations, we concluded that when an Arab passport holder receives an Israeli visa he/she is normalizing Arab relations with the regime of occupation, settler-colonialism and apartheid by treating this regime as if it were normal. Whereas obtaining a permit from the Israeli occupation authorities through the PA is not, despite the problematic nature of the PA’s role, to put it mildly, because Palestinians under occupation are in a coercive relationship with Israel: Palestinians have no choice to receive family or friends from the Arab world without dealing with the Israeli authorities. But such dealings do not per se recognize Israel’s regime as normal. Still, we recognize this as a difficult area, and we admit that it is not the most robust or irrefutable of our guidelines. My question is this: Why don’t Palestinian BDS critics at home or in exile write to us if they seek clarification or want to share their criticisms in a constructive way that strengthens our collective movement? We get hundreds of emails daily from solidarity activists but very few from Palestinians. 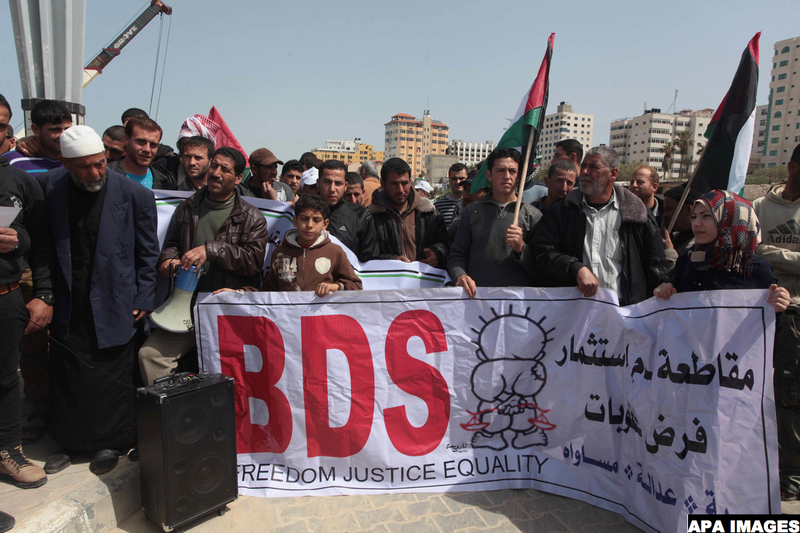 A few Palestinians attack BDS without bothering to first write to the BNC and express their critique in a way that can help make this already effective movement better and more able to handle the many challenges facing it. We are open to and we sincerely encourage discussion and debate among Palestinians in our diverse communities. I beg those with questions, criticisms, or comments to communicate with us – just write to [email protected] or [email protected] Despite the workload we, as volunteers, have to deal with, we do our utmost to respond to every email we receive, especially one coming from a Palestinian sister or brother.